Our managed service provider (MSP) agreement include IT support & management for businesses of all sizes. Our team of qualified computer and network engineers develop preventative, proactive, and reactive solutions for any IT environment. How Efficient is Your Current Infrastructure? Every year, hundreds of hours of work are lost to inefficient computer hardware and software. As a business owner, these concerns are usually among the last and often go unseen. Part of understanding your business is knowing how quickly inefficiencies can incur cost simply by using old desktops, under-rated server hardware, outdated software, and old networking equipment. Did you know that you can lose Wi-Fi signal strength after a unit has been on for years? Internal components begin to crack as cooling and constant heating are wearing down your device, causing it to function poorly. 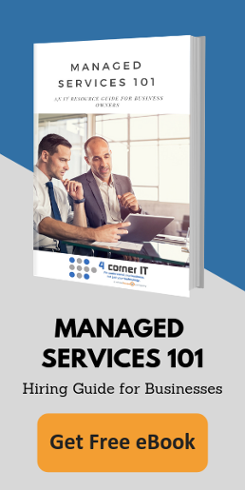 For over a decade, 4 Corner IT has been providing South Florida’s Broward, Miami-Dade, and Palm Beach counties with word-class managed services and reaching further into other aspects of the technology market thanks to our many partnerships, offering only the most qualified professionals in your corner, our corner, here at 4 Corner IT. Our team specializes in network support management, cloud services solutions, disaster recovery, and dedicated hosting. Working with several types of industries has allowed us to not only become versatile, but also able to anticipate the needs of the various businesses and organizations we support and manage.